As ever with White Street we have to determine which one. Easterton and Market Lavington both have one and West Lavington has another. This one is the Market Lavington White Street. It is a high vantage point and immediately, on the right, we have ‘The Loose Box’ which was Tom and Peggy Gye’s last home. Was this taken from the large beech tree which occupied the front of Beech House? If so, perhaps it was taken as that tree was dismantled bit by bit. On the right side of White Street, between the white fronted buildings and the low level structure there is the entrance to Gye’s Yard. Later, that single storey building became Pat Wilshin’s ‘Lavington Services’ shop – still much missed in the village. Above that area and near the cedar tree is the Old House, set back on Parsonage Lane. The museum building was visible from here – we see the gable end in the centre of this image with the tall (and now removed) chimney. And further to the left is the church which looks as though it might have been having roof repairs to the chancel end. What a wonderful myriad collection of chimney pots! Gye’s Yard on White Street had been a part of the Market Lavington scene for more than 100 years when this photo was taken. This dates from 1989 and was taken from in the yard, looking out. But we can compare it with a much older view, looking in. This was in 1906. 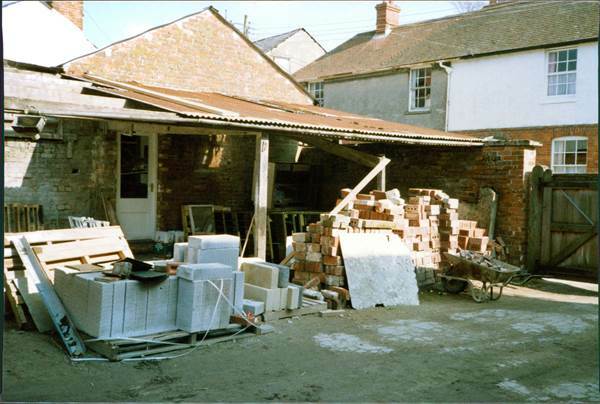 The lean to shelter on the right of the old photo is on the left in the 1989 version. Of course, in 1989 the yard had reached the end of the line and the buildings we see in the old photo were on the verge of conversion into dwellings. The 1989 view looks out onto White Street. The house we see across the road were once a single storey pub called the Brewery Tap. And yes, there was indeed a brewery. When that pub closed, back in the early 1920s, Market Lavington lost its last commercial brewery, which had been run by Norman Neate. We keep such memories alive at Market Lavington Museum. 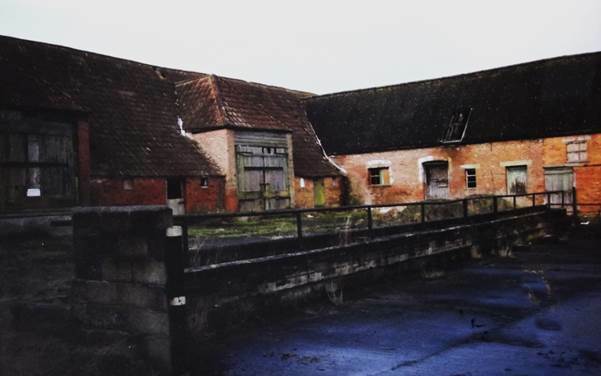 People who live in what is now called White Horse Barns may like to see this photo of their homes, before conversion. Knapp Farm Barns before conversion to White Horse Barns. The photo dates from 1997. This photo, obviously not taken in ideal conditions, dates from about 1997, soon before the conversion into homes took place. It is recognisably the same place, albeit it is a much tidier environment now. The conversion was very sympathetic to the original lines and purpose of the building. The strip of land alongside the road up Lavington Hill has been much dug in the past. Perhaps a clue as to the reason came in the name of a vanished farm just at the top of the hill. 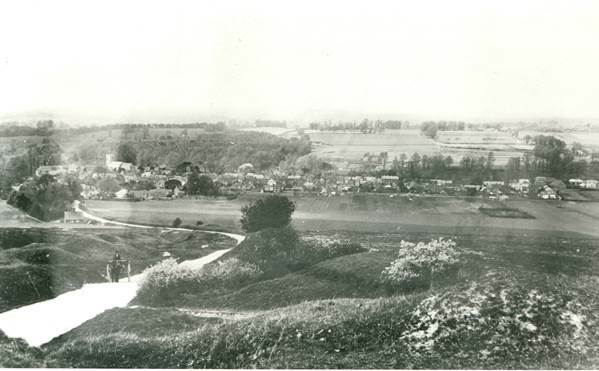 It was called Lime Kiln Farm which might suggest that chalk was removed for conversion into agricultural lime. 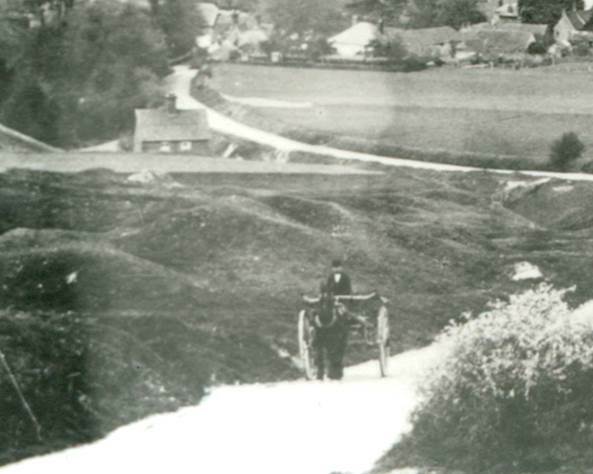 An old and slightly light spoiled photo certainly shows a humpy-bumpy area on both sides of the hill road. We can, of course, see why roads which led up onto Salisbury Plain were called White Street. It is nothing more nor less than a statement of fact. This is the one in Market Lavington, but Easterton and West Lavington have theirs as well. We can see the village down below spread out along the vale with the sandstone ridge rising up beyond. The photo tends to flatten the scene. From Broadwell to the top of the hill is about a kilometre and in that distance there is a climb of about 100 metres so the average slope is about 1 in 10 or 10%. It’s enough that it would have been hard work for the pony hauling a little cart of some kind up the hill. This close up really indicates just how much digging had taken place in that area. This is the section that is now set aside – not used for crop growing but left for nature. 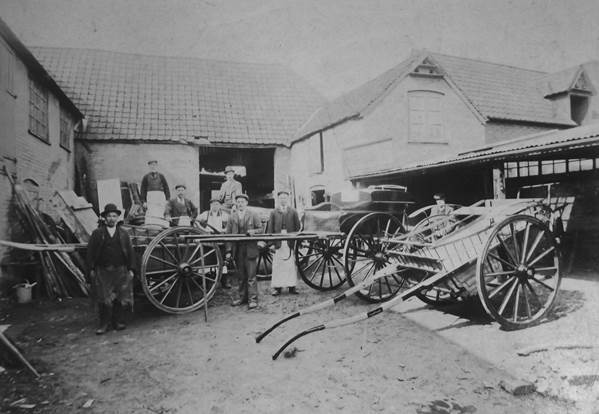 How splendid to come across another photo of a forgotten scene in Easterton. It can be hard to explain just where a vanished building stood. Perhaps this view will make it clear. The sign on the right, which reads ‘White Street and Downs only’ stood outside Manor Cottage. That still stands and has recently had a face lift. The sign, of course, pointed straight up Easterton’s White Street. 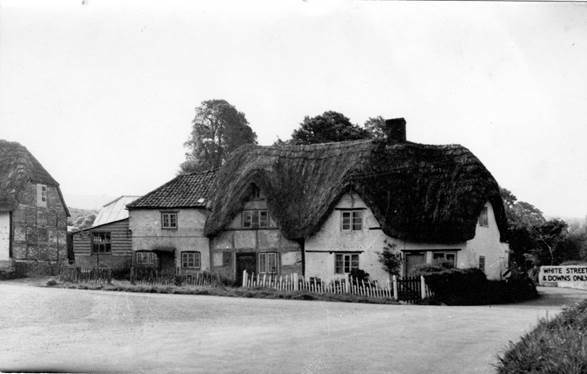 The road we see curling round the old thatched dwelling was the road leaving Easterton and heading for Market Lavington. Planners decided it would be better if the old dwellings were demolished and the road was straightened. And that is what happened. The attractive cottages were swept away and now only exist in the memory and on old photos. A part of the thatched building had once been a bakery. When Jim Sheppard first came to Easterton, it was this bakery he occupied. Later he moved to newer premises a bit further along Easterton Street. Another part of the building was once known as Kandy Cottage for that common reason Ken AND Yvonne lived there – K AND Y. At the left of the photo is a bit of the Court Close farmhouse and that still stands.